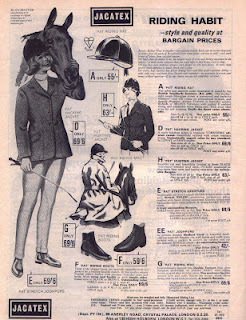 The Jacatex page in PONY Magazine was something you poured over for hours at a time, trying to work out if there was some way you could magic together the enormous amount of shillings necessary to get the ‘Pat’ riding mac. Or the ‘Pat’ hacking jacket. Or the ‘Pat’ jodphurs. Anything, really, that wasn’t the elephant ear jodphurs that were about third-hand when you got them. Reading PONY Magazine cover-to-cover, even Pat and Pickles, which somehow you never really took to. Knowing Jill’s Gymkhana off by heart. And Jackie Won a Pony. And I Had Two Ponies. And No Mistaking Corker. And any other pony book you could get your hands on. Riding ponies up from the field in just a headcollar. You had a hat as a small nod to health and safety.